Republic of Cyprus is an island (or rather half an island) country in the Eastern Mediterranean Sea, east of Greece and south of Turkey. It is the third largest island in the Mediterranean Sea, and a member state of the European Union. Half of the island of Cyprus is controlled by Turkey. Until now, Cyprus was considered an affluent country with its per capita GDP (adjusted for purchasing power) at $28,381, just above the average of the European Union. Cyprus was found to be an attractive base for several offshore businesses for its highly developed infrastructure. It's 14 Billion Euro economy depends upon tourism, financial services, and shipping. On 1st of January 2008, Cyprus adopted the euro as the national currency. In recent years significant quantities of offshore natural gas have been discovered in the area known as Aphrodite in Cyprus' exclusive economic zone. Since 1974 invasion by Turkish forces, which split the island in two, Cyprus is facing its worst crisis today. It all started when Cyprus joined the European union in 2008. Wealthy Russians and Britons found Cyprus' business model as an offshore financial centre extremely attractive and huge sums were deposited in bank accounts from abroad. 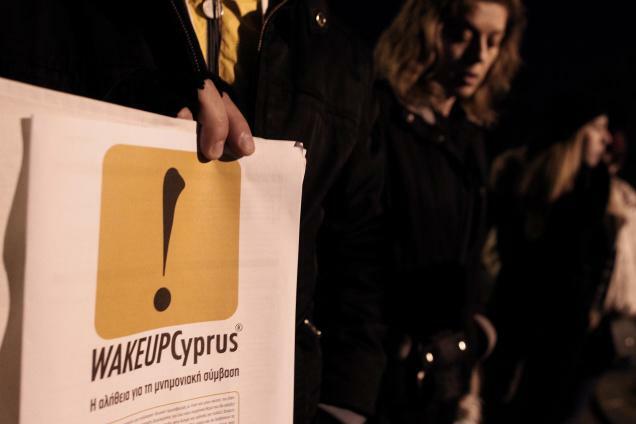 Russian citizens and companies have billions of euros at stake in Cypriot banks. 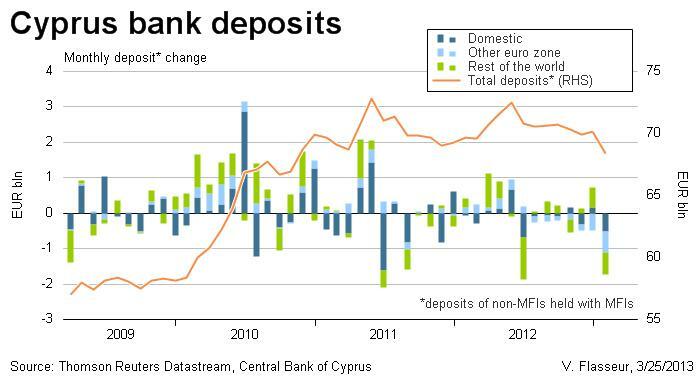 Cyprus's banking sector, now has assets eight times the size of its economy. The Cyprus banks hold 68 billion euros in deposits, including 38 billion in accounts of more than 100,000 euros, astronomical amount of money for an island of 1.1 million people, which could never sustain such a big financial system on its own. Flush with funds, Cyprus banks invested the money in Greek bonds, where the return expected was good. However, when Greek economy collapsed last year, a bailout package given by European central banks stipulated a 75 percent "haircut" (or just give up the money) for the private bond holders. The money invested by Cyprus banks and in particular by the Popular Bank of Cyprus CPBC.CY, also known as Laiki, just evaporated. French Finance Minister Pierre Moscovici says that the island's offshore business model has failed and adds; "To all those who say that we are strangling an entire people ... Cyprus is a casino economy that was on the brink of bankruptcy." The situation has become so grave now that the cash-strapped island nation with a total debt or 5.8 Billion Euros to be paid this week, needs a 10 billion euro bailout ($13 billion) to recapitalize its ailing banks and keep the government afloat. On March 16, 2013, a deal was struck under which depositors in Cypriot banks were to be levied with a one-off tax on their savings to raise the amount of 5.8 Billion Euros. 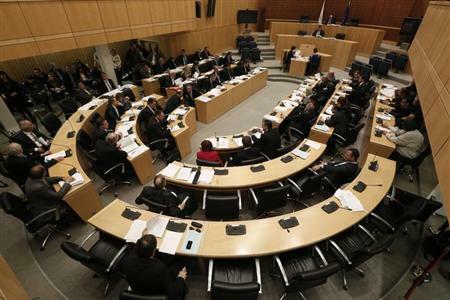 The deal however came off after the Cypriot parliament rejected the deal struck. On 25th March, after a tough round of negotiations, a deal has been struck. Under the new agreement, deposits below the EU deposit-guarantee ceiling of 100,000 euros will be all protected, but all deposits above that amount will have to take losses. Deposits above 100,000 euros, which under EU law are not guaranteed, will be frozen and would be used to resolve debts, and Laiki Bank will effectively be shuttered, with thousands of job losses. It is expected that the two most problematic banks would be restructured and uninsured creditors (having deposits above 100000 Euros) take a 40% hair cut or watch their money going up in smoke. It was widely expected that there would be run on the banks on 25th March, as many Russian depositors had threatened to remove their spoils if they were subjected to any kind of a haircuts. Central Bank of Cyprus imposed a 100-euros per day limit on withdrawals from cash machines at the two biggest banks to avert a run.The new capital controls would make it impossible to move Euros out of Cyprus now. The Cyprus collapse is a great lesson for all developing countries including India. One of the most important lessons is to never let foreign investments in bank accounts as deposits, where interest liability immediately starts accruing. Foreign investments must come into equity markets only. The other important lesson is about the ratio of foreign investments to the size of the economy. If bank deposits grow to eight times the size of economy, it is an invitation for trouble. Repercussions and effects of last year's Greek meltdown, it seems, are still continuing. We need to watch, who is going to be the next?